At Zacks Eye Clinic in central London we see several patients with high astigmatism who require specialist contact lenses. Soft toric contact lenses can be used to correct regular astigmatism. The lenses need to be stabilized so that they do not rotate into the ‘wrong position’. Several soft toric disposable contact lens designs are available in daily, two weekly and monthly ranges, meaning that most patients with moderate astigmatism can achieve good visual acuity with a disposable ‘off the shelf’ contact lens. For patients with high prescriptions, who require extended ranges, tailor made soft toric contact lenses can be made in any size and shape. Those with very high astigmatism or irregular astigmatism usually achieve better visual acuity and more stable vision with rigid gas permeable contact lens designs. Rigid gas permeable contact lenses (RGPs) have a rigid front surface, which covers the cornea to correct corneal astigmatism and irregularities in corneal shape. RGP contact lenses provide an excellent solution for correcting high astigmatism and irregular astigmatism. RGP contact lenses can be made in any size and shape from very small corneal lenses to very large scleral lenses. RGP contact lenses are also available with Toric (rugby ball shaped) front and back surfaces, which can be used to improve their fitting and visual correction. 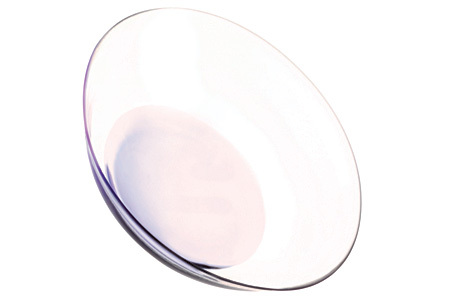 These are known as front surface toric, back surface toric or bi-toric rigid gas permeable contact lenses. RGP’s can even be modified in individual quadrants to correct the most astigmatic and irregular corneal profiles. Hybrid contact lenses have a rigid gas permeable centre with a soft surround, combining the visual benefits of a rigid gas permeable contact lens with the comfort of a soft contact lens. The soft skirt can also provide a functional benefit in maintaining good centration and stability on a very astigmatic eye. Hybrid contact lenses provide an excellent solution for patients with high astigmatism or irregular astigmatism that are unable to achieve good visual acuity with a soft toric contact lens and have difficulty adapting to rigid gas permeable contact lenses. For more information on contact lenses for astigmatism or to find which type of contact lenses would be most suitable for your eyes, please get in touch to make an appointment for a consultation at our London practice.